Today we will look at a different functionality of Order Delivery Date Lite for WooCommerce plugin which provides ease to the customers in the order process. This is achieved by having the first available delivery date preselected using the Auto-populate functionality of the plugin. Hence customers will no longer have to click on the delivery calendar and then select the date for delivery on the checkout page. Let us have a look at how this works. As you can see, the delivery date is automatically prompted in the delivery calendar on the checkout page. 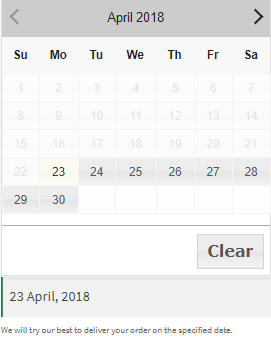 If this is the date you want for your delivery then you do not need to select any date in this field again. Hence, customer needs no extra efforts in selecting date for delivery of the order. This functionality enables populating first available delivery date automatically on the delivery calendar at checkout.This makes the order process faster and easier for order deliveries without you having to select the date from the calendar on the checkout page.